Described as a "weak ruler" Alamgir lacked the training, even though he may well have had the will, to rule competently, or to reverse the decline that had already started. He was not so much an actor in events, or a maker of history an observer or even a victim. He was unable to neutralize the power of the man who had made him king, who would also unmake him nor did he have the skill to exert direct authority. Silver rupee minted in the name of Mughal Emperor Alamgir II. Aziz-ud-Din, the second son of Jahandar Shah, was raised to the throne by Ghazi-ud-Din Imad-ul-Mulk after he deposed Ahmad Shah Bahadur in 1754, whom he blinded, imprisoned and later killed (1775). During Ahmad Shah's reign, the Persian ruler, Nader Shah had sacked Delhi (1738-1739) and carried off both the Peacock Throne and the Koh-i-Noor diamond, both symbols of Moghul prestige and so much treasure that Persians subsequently enjoyed a three year holiday from taxation. According to Schimmel, et al, Ahmad Shah had been raised by "women" and taught nothing about military matters. The Mughal empire never recovered financially from this plundering. The Vizier, whose grand-father had ruled the State of Hyderababd from 1720 until his death in 1748, effectively governed the Empire under both Ahmad Shah and Alamgir II. Since he could not claim the throne himself, he tried to control it by ruling through weaker men who had the advantage of belonging to the Moghul dynasty. The later Mughal Emperors' policy of either imprisoning, or killing anyone with a rival claim on the throne almost guaranteed that whoever succeeded them was ill-prepared to govern. On ascending the throne, Aziz-ud-Din took the title of Alamgir and tried to model himself on Aurangzeb, who had called himself Alamgir I. However, at the time of his accession to the throne he was already 55-years-old and possessed few or none of the talents of Aurangzeb, whose chosen title of "world conqueror" may have been apt, given that he led a considerable increase of the Empire's size, power and wealth. Alamgir II, however, had no experience of administration or warfare, having spent most of his life in jail. Although he may well have wanted to exercise power himself, Alamgir remained a puppet of his own vizier, (Wazir) Ghazi-ud-Din Imad-ul-Mulk, in whose hands power remained throughout his reign. In 1756, Ahmad Shah Durrani invaded India, captured Delhi and plundered Mathura. Ghazi-ud-Din was compelled to ask the Hindu Maratha's for help in fighting the Afghan threat. Consequently, the Marathas expanded their own territory at the Mughal's expense, although Ahmad Shah Durrani defeated them in the third Battle of Panipat, halting their Northerly advance. Court intrigue saw Alamgir allied with a cabal that opposed the Vizier's power. However, the Vizier's own success in ensuring the empire's survival even though all but a vassal state under Durrani, and his use of Maratha body-guards, consolidated his own power and made him more or less untouchable. Fighting with the Marathas when they liberated the Punjab from Ahmad Shah Durrani's rule enabled him to enrich himself, while the empire he served remained impoverished, Alamgir's own attempts to exert direct authority failed because he lacked the skill nor could he neutralize his powerful vizier. In 1757, the British East India Company troops under Clive of India defeat the Mughal's subject ruler, Siraj Ud Daulah, the Nawab of Bengal, and assume effective rule of that wealthy province. Although semi independent under its Nawab, Bengal was still a source of valuable revenue. Loss of Bengal was another blow to Mughal prestige. As Ahmad Shah Durrani prepared to retake the Punjab from the Hindu Marathas, encouraged by Muslim leaders such as Shah Waliullah, relations between Alamgir and the Vizier, Ghazi-ud-Din deteriorated beyond repair. Fearing that Alamgir might fall captive to the Afghan overlord and well aware that the imperial treasury could not afford to pay a ransom, the vizier ended Alamgir's life in the same way he had ended his predecessors—by killing him. The vizier then quickly left for the hajj in Mecca and was never punished for either act of regicide. Map of the Moghul Empire showing greatest extent before its decline following Aurangzeb's 48 year reign (1707). He was briefly succeeded by Shah Jahan III, a grandson of Aurangzeb by his second son, Muhammad Kam Baksh) who was deposed the very next year and was technically replaced by Shah Alam II, Alamgir's own son. Defeated by a British army in 1764 which left him homeless and a fugitive, Shah Alam (who has been blinded by the Afghans) had little choice but to grant the British virtual sovereignty of the province of Bengal with the Treaty of Allahabad of 1765. According to Schimmel, Attwood and Waghmar, Shah Alam spent the rest of his rule as a "puppet of the leader of the Maratha's, Sindhia, who enjoyed the support of the British" and before his death, he was impoverished in his own palace; "foreign visitors reported that they could hear cries of hunger coming from the quarters of the ... princes." The British occupied Delhi in 1803, and from then until 1806, when he died, Alamgir's heir depended on a pension from the East India Company, living by their grace and favor. While the last Moghul emperor is usually identified with [[Bahadur Shah II) (1837-1858) who supported the rebellion of 1857, in many respects Alamgir II was the last emperor to enjoy even a modicum of independence. Although coins were struck in his name, Alamgir did not leave any artistic or architectural legacy behind him. Later, the British fought the Marathas and finally ended their power in 1818. The Sikhs took control of the Punjab in 1766, where Maharaja Ranjit Singh carved out a kingdom in 1801 which remained independent until it was annexed by the British in 1849. Alamgir II was not so much a failure as the product of a failing empire. The emperors from Aurangzeb to Ahmad Shah were more concerned with maintaining a luxurious life-style at court than they were with governance, and used the imperial treasury to support their extravagance and to pay their generals to protect the empire's borders. Then Ahmad Shah's incompetence resulted in the imperial treasury's loss to the Persian ruler, so his successors could no longer afford to pay for the empire's security. While the Mughal's original strength had been based on their superior military skill and weaponry, they no longer had either. 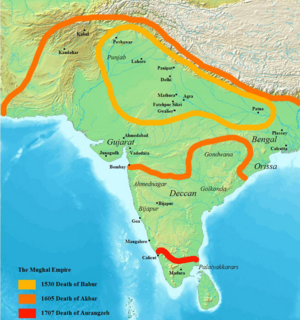 This allowed other Indian powers, such as the Maratha to encroach on their territory as well as external powers such as Persia and the emerging Durrani Empire. However, it would be the British who eventually ended the Moghul empire and their victory over the governor of Bengal at the Battle of Plassey in 1857, in the third year of Alamgir's reign, set in motion their ascendancy in India. The Mughal Empire fell as much as the result of implosion from within as of the external success of its enemies. ↑ Frank McLynn, 2004, 1759: the year Britain became master of the world. (New York, NY: Atlantic Monthly Press. ISBN 9780871138811). ↑ 2.0 2.1 Annemarie Schimmel, Corinne Attwood, and Burzine K. Waghmar, 2005. The empire of the great Mughals: history, art, and culture. (New Delhi, IN: Oxford University Press. ISBN 9780195673340). Eraly, Abraham. 2004. The Mughal throne: the saga of India's great emperors. London, UK: Phoenix. ISBN 9780753817582. Hansen, Waldemar. 1972. The Peacock Throne; the drama of Mogul India. New York, NY: Holt, Rinehart and Winston. ISBN 9780030002717. Richards, John F. 1993. The Mughal Empire. The New Cambridge history of India, I, 5. Cambridge, UK: Cambridge University Press. ISBN 9780521251198. Robinson, Francis. 2007. The Mughal emperors and the Islamic dynasties of India, Iran and Central Asia, 1206-1925. New York, NY: Thames & Hudson. ISBN 9780500251348. This page was last modified on 15 February 2019, at 23:00.